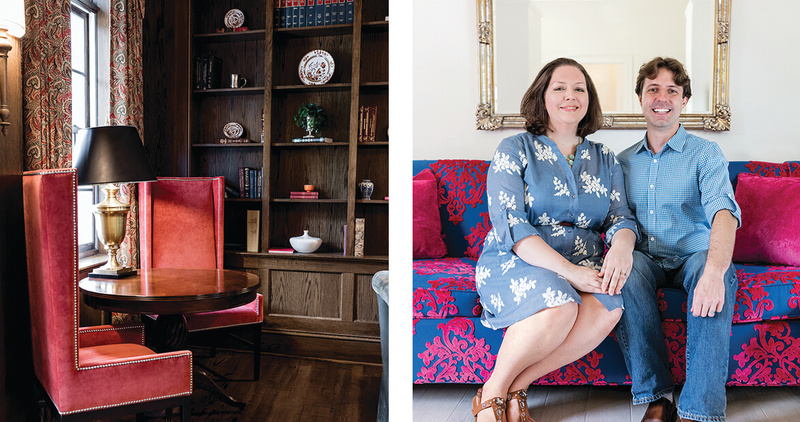 One couple’s passion project gives Cary residents and visitors a new place to get away, dine out — or even stay in. “We call it ‘The Love Shack,’” Deanna Crossman says. “Jokingly!” Really, the little white structure is the Waldo Cottage — or the 45th guest room — at The Mayton Inn, Cary’s first boutique hotel. While the other 44 rooms compose the inn itself, the Waldo Cottage lives in the backyard, just beyond the inn’s restaurant, Verandah. Built in the 1880s, it was home to one of Cary’s first physicians. Now, it’s one of the hotel’s most coveted nests. Though the outside is humble, the inside boasts fuchsia furniture and a shag carpet, a round bed and a fireplace, a two-faucet shower and an oversize tub. You might wonder how anyone could envision all that inside a 19th-century cottage — until you meet the Crossmans. Real estate brought Deanna and her husband, Colin, together when they bought fixer-uppers across the street from each other in Durham. Their first “dates” were home improvement projects. And their first “children” were timeworn properties that they bought and refurbished together. But by 2007, the year after they got married, the housing market was beginning to crack. The Crossmans decided to refocus their energy — and reroute their careers. “We figured out we didn’t love our day jobs,” Colin says. They did love something else: The King’s Daughters Home, a home for single, aging women, in Durham. When the 1925 building went on the market, the Crossmans leapt at the chance to start a bed and breakfast. The King’s Daughters Inn opened in 2009 and started accumulating awards within its first year. In fact, it garnered so much acclaim that, one day, the Crossmans got a call. It was Ed Gawf, Cary’s downtown manager, with an idea: How about another hotel? The Crossmans built a spacious, striking brick structure, an old soul with modern amenities. There are rooms in every color, from periwinkle to purple to chartreuse. At Verandah, out-of-towners and locals alike feast on eggs with andouille gravy and Southern-fried quail. There’s also a bar, a spa, and a wine cellar with a penny-tile floor — shiny and new, tarnished and old. Something special, whether it’s an impromptu dinner date on a Wednesday, or a place to stay the night after too many pubs — or, even, a love shack.